Workers with Lima Rehabilitation and Nursing have been in negotiations for their next three year contract. Hillstone Healthcare is offering a contract with a 0% wage increase for the next three years. All working people deserve a living wage. “White Oak Financing” recently acted as a lender for a $161 million credit facility for Allegiant Healthcare and Hillstone Healthcare. With this deal, Hillstone Healthcare may now operate as many as 17 more long-term care facilities. 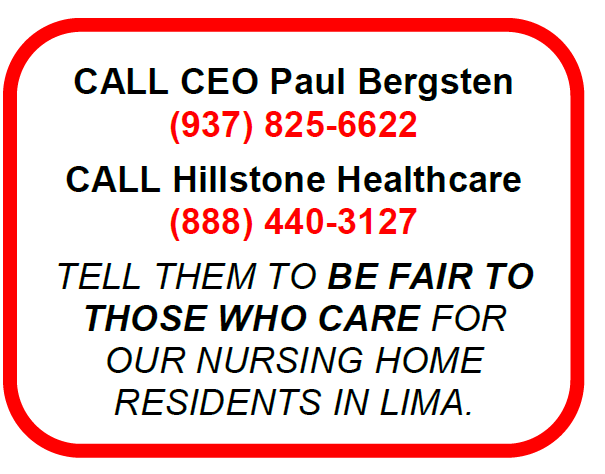 It is time that CEO PAUL BERGSTEN does more to help those who care for residents at the Lima Rehabilitation and Nursing Center. All workers in our community need respect.